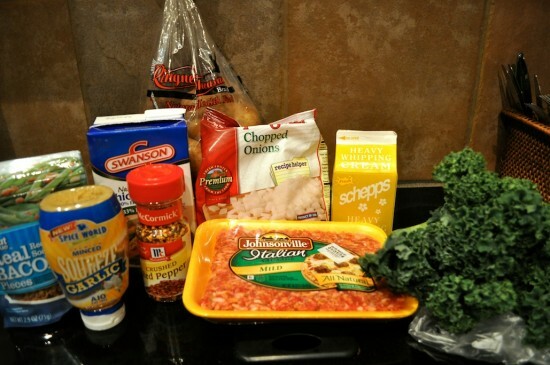 All this cold weather has inspired me to get in the kitchen and whip up a batch of something warm and tasty. A great big bowl of soup sounds perfect right about now. 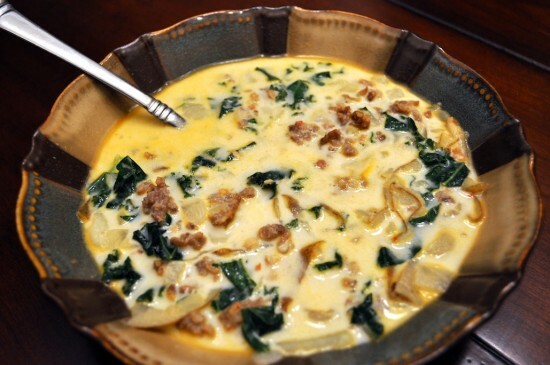 One soup that I enjoy eating is the Olive Garden’s Zuppa Toscana. There are several recipes out there, so I decided to pick one and take a crack at it. I can never use another person’s recipe without adding a few of my own personal touches. I originally found an easy to follow recipe at Mom On Time Out. The following is my adapted version of her recipe. Preheat your oven to 300 degrees. Line a cookie sheet with parchment paper. 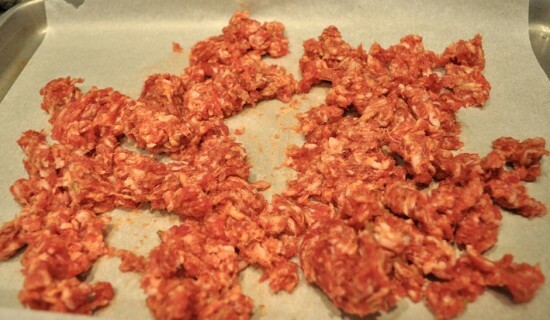 Place the meat on the paper and use a spatula to chop it into smaller pieces. Spread out the meat so that it can bake evenly. While your meat is in the oven, measure out the garlic and onions. Next, wash and thinly slice the potatoes. By now, your meat should be finished baking. Mine stayed in the oven for about 20 minutes. Depending on how hot your oven runs and how thinly the meat is spread out, the time may be longer or shorter. Keep an eye on it! Transfer the cooked meat to a clean plate. With a paper towel, blot and press out the grease. You want to get as much grease out of the meat as possible. 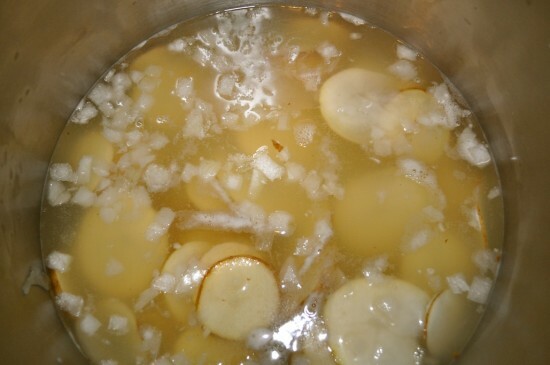 In a large stock pot, add the garlic, onion, chicken broth, water, and potatoes. Let this cook together for about 15-20 minutes. 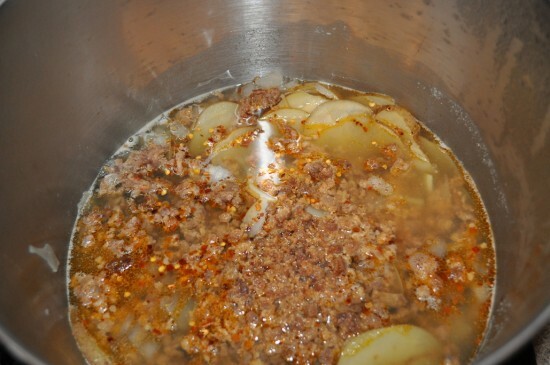 Next, add the bacon pieces, crushed red pepper, and meat to the cooking pot. If you do not like spicy, I would use only a fraction of the red pepper flakes. You will then wash and chop up the kale into small pieces. 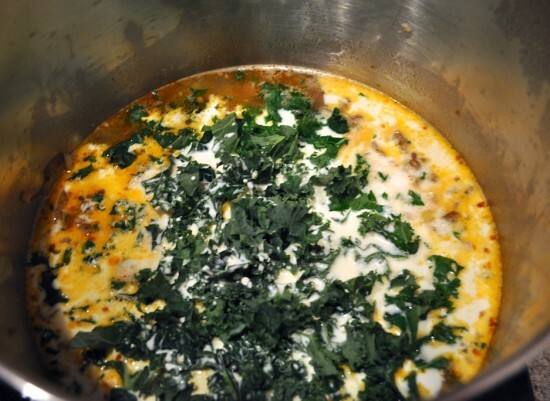 Add both kale and heavy whipping cream to the soup and let simmer for 10-15 minutes. Find a spoon, grab a bowl and enjoy!